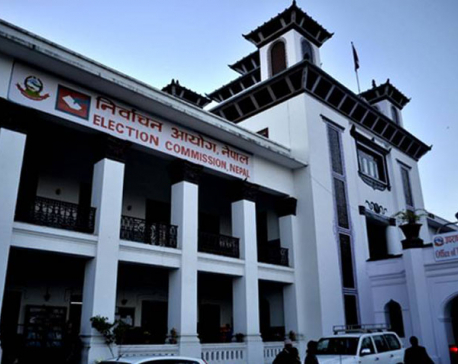 KATHMANDU, Oct 12: A dispute over whether to introduce the Single Transferable Vote (STV) system has halted the endorsement of the National Assembly Election Bill in parliament. The National Assembly election law will have to be introduced through an ordinance if the bill is not passed by the House by Friday as the present parliament is set to go idle after just two meetings -- on Thursday and Friday. But the stalemate between the ruling Nepali Congress (NC) and main opposition CPN-UML over the STV system for the election of National Assembly members has made the endorsement of the key bill uncertain. The two major political parties have resorted to trading barbs even in the eleventh hour of the dissolution of the House. The key election law for the implementation of the new constitution was removed from the House business list in the last hour for the last few days after the two parties failed to reach a consensus. The ruling NC has demanded the STV system to elect the National Assembly also known as the Upper House through the revision of the government-tabled bill. NC has claimed that the original bill doesn't ensure equal representation of all communities and political parties. But the UML has questioned the motive of the NC and accused it of demanding changes to the law fearing the upcoming election. The CPN (Maoist Center) has remained neutral on the issue. He further claimed that their demand, if fulfilled, would also reduces the number of waste votes. NC has said that many countries including the UK, India, and Australia have adopted this election system for the upper House election. But UML has claimed that with the Article 86 of the new constitution itself ensuring representation of three women, a dalit and a person with disabilities or marginalized community member from each province there is no need for such a complex voting system. “The bill was tabled by the same government which NC is leading. But the party's demand to change the provision in the last hour seems that the party fears the election results after the alliance of left political parties,” said UML Chief Whip Bhanu Bhakta Dhakal. The bill has also defined different voting weightages of provincial assembly members and chiefs or deputy chiefs of the local units. According to the lawmakers and experts, the STV system is a unique election system practiced in some English speaking countries. In this system voters are allowed to cast preferred votes for candidates with first, second and third ranking. In this election system, the minimum threshold for the election of a candidate will be determined and if the candidate receives more than required votes, it will be transferred to the second ranked candidate based on the preferences set by parties or the voters.